My Grandma and Grandpa (Dad's side) have passed on... They provided the most excellent childhood memories!. They had a small house in quaint St. Charles Idaho... It is the most beautiful place on earth . My parents now own their little home and it makes a fantastic escape. 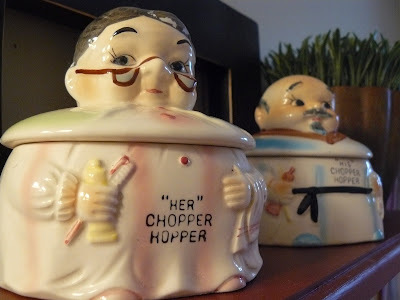 One of my favorite memories of staying with my grandparents are the "chopper hoppers". They are in fact the only inheritance I received. come to think of it they still are. I have made a special place in my bathroom for the chopper hoppers. Rest in peace grams and gramps love you. Dad and I loved your comments on your inheritance!! !Snappy little picture of the snapper holders!!! You sure are a funny girl...We really enjoy your sense of humor..Maybe you should do stand up!! !We love you bunches.. Keep up the good work..Sorry you inheritated so much nuttiness from us...Did you know your dad can't stand to go barefoot either??? I have never heard of those. But it's a very cute story. Hey, now I am paranoid and setting my blog to private. :) Send me your email address at mommymeliss@gmail.com and I'll invite you. Wow its amazing the little things that mean the most to children!! I'm so glad you have your able to keep one of your favorite memories so close!! You really are do funny and thats why I love ya!! That's where those things went! Sweet! I'm glad they haven't been relegated to some dusty box in a basement. Although they never held as much fascination for me as they did for you ;), they were quite a hallmark of the Grandparents.